The Kawartha Base Camp Blanket is a versatile travel companion on any camping trip, tailgate, or picnic. It’s even great on the porch and in a hammock. Jezebel readers can grab a blanket for just $45 & take 50% off with code BCB50FEB at checkout. Kawartha designed the Base Camp Blanket (54" x 78" unfolded) from 20D Ripstop Nylon with a durable water repellent finish to withstand liquids and prevent stains. 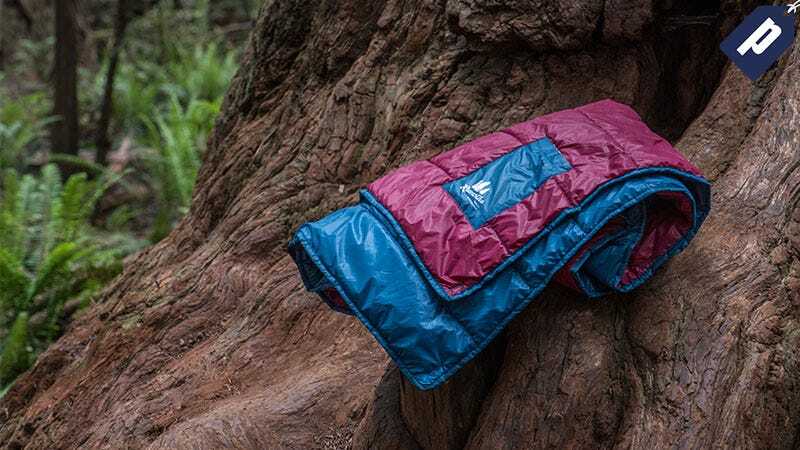 Similar to many sleeping bags, the interior is filled with a synthetic down insulation to maximize warmth yet limiting weight and bulk (1LB 3oz). Each blanket comes with a velcro pocket to hold small belongings and a stuff sack (16" x 7.5") for compact storage. Plus, take advantage of the 8 grommets (4 on each side) to tie up and stake anywhere on a windy day. Choose from one single blanket in either maroon/blue or navy/gray ($45). Enter code BCB50FEB at checkout to save 50%.